“high fibre” “source of fibre” “added fibre”…. We see these claims on our food packaging when doing our weekly shop. While most of us know that good sources of fibre are found in fruits, vegetables, legumes and whole grains, we don’t know that much about how it actually works once it’s in our digestive system. This complex carbohydrate is like no other food component, it is not digested by your body but instead passes through your stomach, small intestine, and colon and well; you know the rest. Scientists are now more clear that the fibre we eat feeds millions of bacteria in our guts, and if our gut bacteria is happy, our intestines and immune systems are kept in good working order. 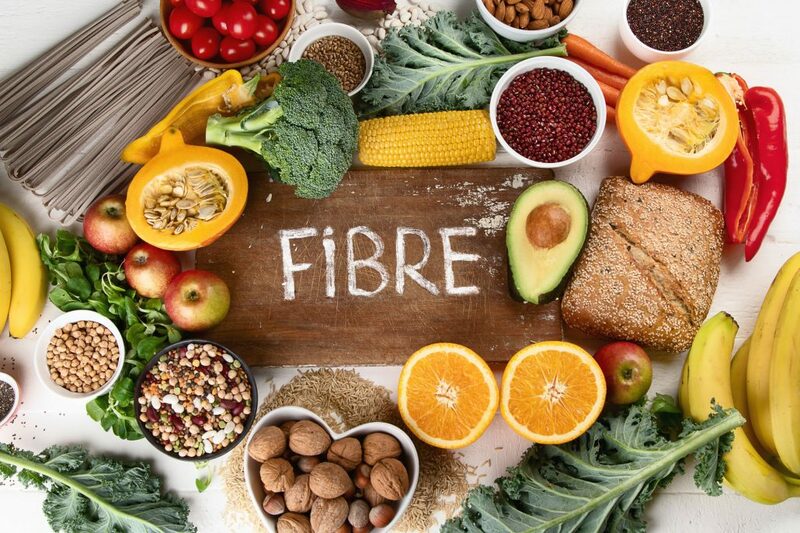 Increasing our dietary fibre has been linked to reducing the risks of heart disease, diabetes, bowel cancer and arthritis as well as that well known job of relieving constipation! Fibre has also been proven to decrease the chances of Diverticulitis by 40%. Never heard of Diverticulitis before? Me neither, but it inflames the intestine and is one of the most common age-related digestives disorders in the modern world. Interestingly enough, fibre can be identified by two different forms – soluble and insoluble. Soluble dissolves in water and can help lower blood cholesterol and glucose levels and can be found in foods like oats, beans and citrus fruits. Insoluble fibre promotes the movement of ‘food’ through your digestive system and increases stool bulk. Insoluble fibre aids relief of constipation and can be found in foods like nuts, beans, and cauliflower. Be aware of refined or processed foods because they lower the fibre content, as the process removes the outer coat (bran) from the grain. Some foods do have the B vitamins and iron added back after the processing BUT NOT the fibre. So how much do we need? It has been stated by the institute of medicine that men under the age of 50 require 38 grams per day; whereas men over 51 require 30 grams. For women under the age of 50, 25 grams of fibre per day is recommended; whereas women over 51 only require 21 grams of fibre. So, when you are doing your next food shop, just make sure you are thinking not just about feeding your family, but also feeding the incredibly important bacteria that lives in their guts!